Joseph H. Steere was born in Addison, Michigan, on May 19, 1852, educated in the public schools of Addison, and continued his studies in the Raisin Valley Seminary, where he was graduated in 1871. In the fall of 1872, Steere entered the Literary Department of the University of Michigan and was graduated in 1876. He then studied law and was admitted to the Bar in 1878. Steere came to Sault Ste. Marie in the year 1878, where he was a resident until the time of his death. Steere knew better than most the history of the Upper Peninsula, which he loved, and he left to his hometown an invaluable historical library of the northern region. He knew the birds and the flowers, their Indian names, and the legends about them. In his study of the out-of-doors, he was as painstaking and thorough as in his study of the law. Steere was described as slight of figure, not of robust constitution, modest of manner, gentle of mien, quiet of conversation, unassertive, and a professing and practicing Quaker. During his first year at the Soo he was appointed Prosecuting Attorney and served in that capacity until 1881, when he was elected Circuit Judge of the Eleventh Judicial District. Steere continued to serve as Circuit Judge of this district for 30 years. 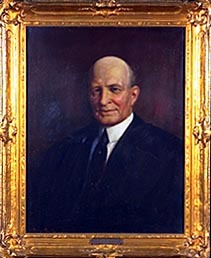 He was appointed to the Michigan Supreme Court in 1911 and voluntarily resigned from the Court in 1927. He had served on the Bench for a continuous period of 46 years.